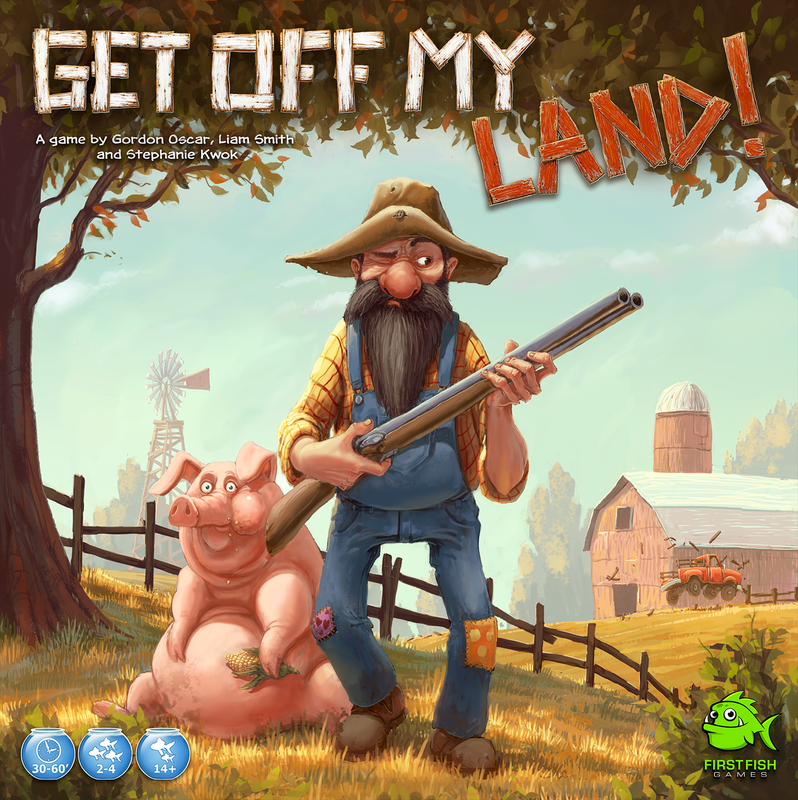 Preview Review of Get Off My Land! Recently I was given the opportunity to preview an upcoming new game that is soon to be available to back on Kickstarter. I received a prototype copy of the game. These are my thoughts and opinions on the presented materials. Enjoy! Get Off My Land! is a game by Gordon Oscar, Liam Smith and Stephanie Kwok, published by First Fish Games. It is for 2-4 players. In this game, players take on the role of feuding farmers that are in a competition to see who can have the most profitable farm. They’ll have to purchase crops and livestock to expand their farms. Of course they’ll have to watch out as their rivals might be using their opponents corn crops to feed their pigs with. They’ll have to be ready to defend their property by any means necessary. In the end, the farmer that can earn the largest fortune over the period of a year, will be declared the winner. To begin, each player chooses a color and is given an action reference/scoring card, 15 fence pieces and a farmer meeple of their chosen color. They also receive $8 worth of money. The remaining money is separated into individual piles and set to the side of the play area. The farmhouse tiles are shuffled together and each player is dealt 2, of which they choose 1 to keep. The other tile is returned to the stack which is then returned to the box. Each player places their tile face down in their starting area. The land tiles are then setup according to the diagram in the rulebook for the number of players. Players should start with 2 logged tiles beside their farmhouse. One of these tiles should be fully fenced, using the wooden fence pieces of the player’s color. The player’s farmhouse should also be fully fenced. It should be noted that the tiles that are not logged or farmhouses should be randomly setup based on charts that are listed in the rulebook for each number of players. For instance, in a 2 player game the tiles used are 1 of fertile land, oil strike, extra wood and extra sales, along with 2 blank tiles. Players should place their farmer meeple on top of their farmhouse tile. The market and market cards should be placed near the tiles. The cards should be separated based on the number of players. Only certain cards are used, unless playing with 4 players. Consult the rulebook for more information on this. The cards not used are returned to the box. The cards are then separated into 3 piles based on the letter on the bottom right corner of the card. Each lettered pile is then shuffled separately and placed in a stack beginning with the C pile, followed by the B and then ending with the A cards on top. The top 5 cards are then drawn and placed in order in the market track slots beginning with the $2 slot. The fence cards are then separated based on the number of players following the guide lines laid out in the rulebook. The cards that are to be used are shuffled together while the remaining ones are returned to the box. Each player is then dealt 2 cards. The remaining deck is then placed face down next to the play area. The month track is placed beside the play area with the month marker placed on the May slot. The first player is chosen and is given the 1st player marker. Play now begins. The game is played over a series of 12 months or 1 year. Each month consists of 3 phases; income phase, player phase and end of month phase. The first phase is the income phase. At the beginning of each month players will collect income based on the income for all their mature crops and livestock. The amount of income is based on the number on each card in front of them. Players earn that amount of money to be used later in that month. The second phase is the player phase. This is where the majority of the action occurs. In this phase, beginning with the first player and continuing in turn order, each player will take their turn to perform 2 actions. Players have 5 options to choose from; logging, playing a fence card for actions, playing a fence card for fences, go to market or harvest. Logging allows the player to flip over a forest tile, revealing the logged side. The player then draws 2 fence cards and if there are any bonuses revealed once the tile is flipped, the player also gains the bonus as well. That bonus could be an extra card or extra money. It should be noted that a player can not log a tile that is fully fenced by another player. Another action that can be taken is to play a fence card for actions. This allows the player to play one of their fence cards face up in front of them and perform the action listed on the card. There are a variety of different actions that these cards allow including performing 2 harvest actions or purchasing any market card for only $2. Of course it should be noted that there are some card options that can wreak havoc on another player, such as breaking 1 of their fence pieces or moving their farmer off one of your land tiles. Once the fence card has been used, it’s it’s sent to the discard pile. Another thing that can be done with fence cards is playing them for fences. This action is only allowed to be used once per turn. This action allows the player to move or place as many fence pieces as there are listed on the card being played. Fence pieces must be placed connected to the player’s farmhouse or to another fence piece that they already have in play. Once a tile is completely surrounded by the player’s fences, it’s considered to be controlled by that particular player. If there are any incomplete fences of another players remaining on the player’s controlled tile, they are removed at the end of the player’s turn. It should be noted that a tile can be fully fenced and not controlled. Fully fenced means that there are fences completely surrounding the tile. This could even include a different player’s fences. However to be controlled, all 4 fences surround the tile must be from the same player. Also of note is that when a player places fences on a tile that contains another player’s fences, the other player is allowed to defend themselves. We’ll discuss this a bit later. Another action for a player to take is to go to market. With this action, the player is allowed to buy a market card from the market track by paying the corresponding cost shown. To be able to purchase a card, the player must be able to place it on a fully fenced and logged land tile that they control. It is then immediately placed on the chosen tile with it’s immature side face up. Equipment cards, however, are placed with their active side face up. Once a card has been purchased, all the remaining cards are slid to the left on the market track, filling in any holes. A new card is then drawn from the top of the deck to fill in the new hole. It should be noted that players are also able to use this action to purchase lumber instead of buying a market card. Buying lumber costs $3 and allows the player to place or move 1 fence piece and draw 2 fence cards. The market card in the $2 slot is then removed from the game. Like before, cards slide to the left to fill in the spot and a new card is drawn to fill the spot. The final option a player can take is the harvest action. This action allows the player to flip a mature crop or livestock card to it’s immature side and collect money equal to the harvest value on the card. The final phase is the end of month phase. Once all players have finished their turn for the current month, this phase begins. In this phase the month marker is moved to the next month on the month track. If any special event icons are passed, the events noted take place. There are growth, winter and first player events. Growth events can be for livestock, crops or equipment. This means that the corresponding cards are flipped to their mature side if they’re livestock or crops, or to the active side if they’re equipment cards. The Winter event removes all the crop cards from the board, except for a certain few that are noted. However these cards won’t mature as there is no growth icon for crops. The first player event simply means that the first player marker is passed to the next player to the left. Earlier I mentioned that players can defend themselves when another player places fences on a tile they have a fence on. Players can also defend themselves from any card or action that targets or affects their property, including fences, market cards and land tiles that they control. This is done with the bullet holes on the fence cards. When a player is attacked they are allowed to play fences cards that total up to 3 bullet holes to cancel the attack. The cards used are discarded after defending. It should be noted that when the player defends, they defend against the entire card. That means that everything that the card attacks is defended against. The game continues until the end of April. 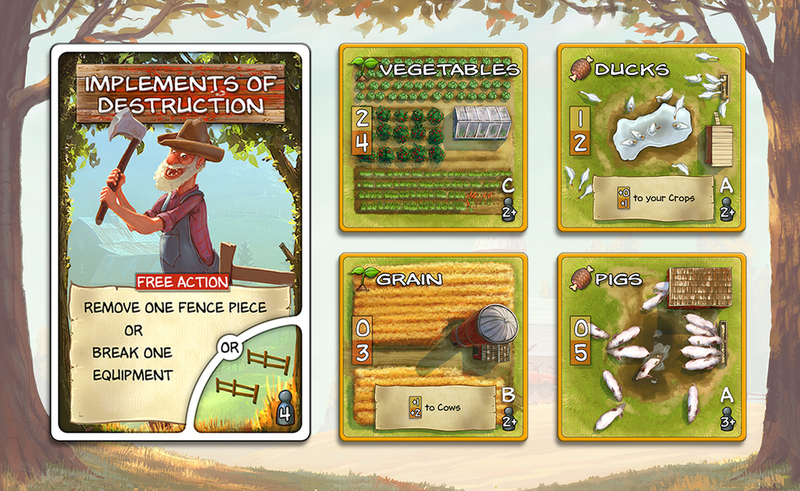 At this point, players collect money for their farmhouse bonuses and equipment cards that they control. Bonuses for controlled oil strike land tiles are also collected. Players then add up the total of their money. The player with the most money is the winner. With this being a prototype, I won’t be too critical of the components at this time. That said, it’s not like I needed to be negative about anything anyway. For a prototype, I’m pretty darn pleased with how everything looks. There are lots of great wooden pieces in several different colors. There are fence pieces and farmer meeples in 4 different colors. I’m really hoping that there is a stretch goal for the kickstarter that upgrades the farmer meeples. I really think the game is just begging for that. Then there’s all the cards and tiles. These all look great and are very thematic. The farmhouse and land tiles are a bit thin at the moment, but here’s hoping they get upgraded to thicker cardboard later on. However even as cards, they’re still great. The fence cards have some really great looking artwork that makes me think of some old feuding hillbillies deep up in the woods. There’s also the market cards and reference cards. On top of all that, the money is also in card form. I really like that. The money even has these really fun and silly looking designs on them. The last pieces are printed wood in the prototype but I’m assuming will end up being thick cardboard in the finished game. Those are the first player marker, month marker, market track and month track. I only have 3 words to say…thematic, thematic, thematic. The first player marker is a 1st place pumpkin like you’d find in a county fair. The month marker is a rooster weather vane. The month track is a giant saw. The market track looks like the canvas tops of a farmer’s market. I’m telling you, this game is dripping with theme and this is just a prototype. I can’t wait to see how much better things get once this game gets finalized. I’m thrilled already. The rulebook that came with the game is also a prototype. That said, I’m pretty darn impressed with what already comes in the box. The rules are on high color glossy pages with lots of beautiful pictures throughout. There are several great double page layouts in the book. There’s one for the components that come with the game and one for setting it up. All the different aspects and phases of the game are laid out in a really great way with plenty of detail. Everything is explained really well and looks great. There are even sections that detail all the different fence cards and what they do, as well as one for the many different farmhouse tiles. I honestly didn’t see anything that was difficult to understand or read. Overall I’m already happy with what’s here and look forward to a fully polished and perfected rulebook. This is a game that I could sit around and play every day of my life. It’s that much fun. There are aspects of area control and take that, along with some tile laying. Just looking at the game, I get a feeling of Among the Stars or Fields of Green. Of course this game doesn’t have card drafting but you’ll get kind of that feeling when you see it laid out. Throughout the game you’ll be trying to do what you can to make sure that you get a steady flow of money coming into your farm. You’ll want to make sure that your maximizing your cash flow based on the items in the market and what’s available on the board. You’ll also want to keep in mind the specific bonuses on your farmhouse tile, which should point you in a specific direction for your play style. This is one little aspect of the game that I absolutely love. Honestly all these tiles could have been exactly the same and every player would have wound up playing the same way. However the fact that each one of these rewards bonuses for different achievements is brilliant. You also have the randomness of the land tiles. You will never know which tiles gonna have oil beneath it and which one is just a blank tile. These aspects lead to a ton of replayability with this game. I also like that players can defend themselves from the actions of other players at the cost of a card or two. You might really want to hang onto that one or two cards you have in your hand but is it worth allowing another player to destroy your fence or some other aspect of your farm? As Kenny Rogers said, “You’ve got to know when to hold ’em.” Fans of area control games like Kingdom Builder or Rococo might enjoy this one. I’d even say fans of games like Among the Stars would like this one too. The theme and feel of the game is great and is one that I look forward to playing many more times. Get Off My Land! is an area control style game with aspects of take that and tile laying. The game doesn’t take too long. Most game sessions last around 45 minutes to an hour. Even though this is a prototype, the game looks and feels great. The theme is awesome and is intertwined throughout the whole game. The artwork and components look great, even in prototype form. The rulebook is also pretty great. Of course I expect that things will continue to get even better once the game is actually produced. As I’ve mentioned earlier, the game really gives me a feel of a Among the Stars or Fields of Green but with area control and take that included. I really like the ease of play and how well this one scales for different numbers of players. The only things that I’d do to improve or add to the game would be to maybe add rules for solo play and upgrade those farmer meeples with either some preprinted designs on them or change the shape to more farmer looking, for example Scoville’s meeples. Overall this is a game that I really enjoy and think will become an absolute hit. I can’t wait to see where this game goes and what the finished product looks like. I highly recommend backing this one on Kickstarter. It’s well worth getting a copy of. Feuding over a copy is optional. For more information about this great game, please check out First Fish Games at their site. You can also back the game on Kickstarter right now and get your own copy. Simply follow the link below. This entry was posted in Preview Reviews and tagged board, board games, card, card games, first, first fish games, fish, games, get, get off my land, gordon, Gordon Oscar, kwok, land, liam, Liam Smith, my, off, oscar, smith, stephanie, Stephanie Kwok. Bookmark the permalink.